It was the morning that parents of young children dread but I managed to embrace the clock change and made the most of my extra hour this morning. 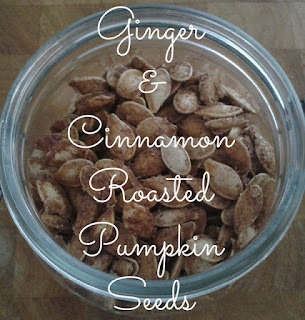 I woke at 6:30 and decided to hop to it and soon the smell of ginger and cinnamon roasted pumpkin seeds was wafting through the house - although the children didn't appreciate it as they were taking part in one major Sunday morning sleep in. 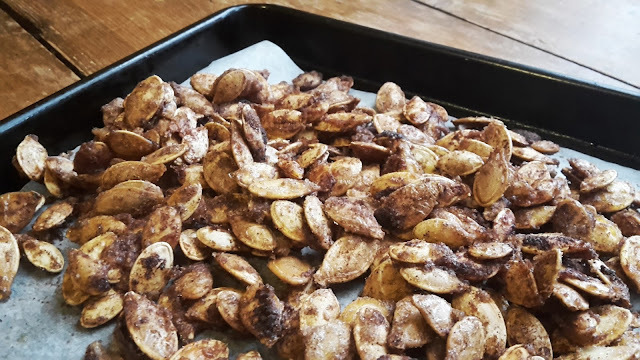 Every year, following our annual pumpkin carving day, I clean, dry out and roast the seeds from the aforementioned large orange vegetable ready for my daughter and I to nibble on over the following days. 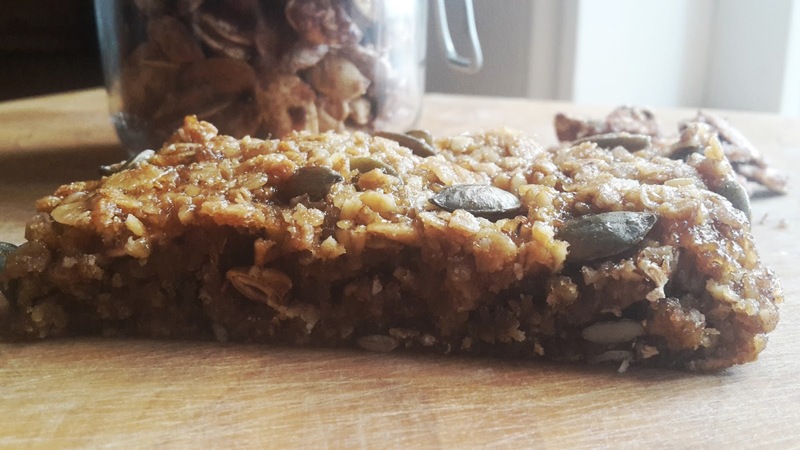 Today though I decided to use some of the seeds in some baking and having the usual over ripe banana situation going on decided to make some vegan energy bars loosely based on my go to flapjack recipe, but healthier and vegan friendly. Line a baking tin with baking paper - my tin measured approx. 19x29cm. 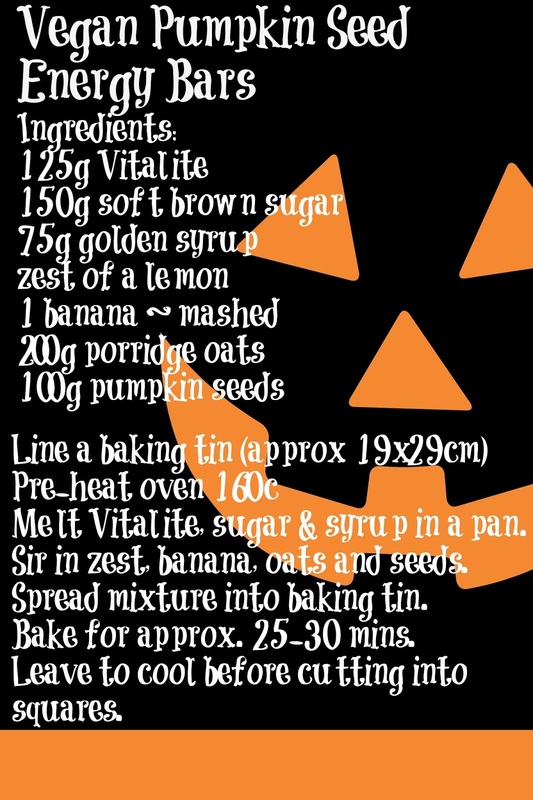 In a saucepan melt the Vitalite, sugar and golden syrup. Once all melted give it a good stir then add the lemon zest, mashed up banana, porridge oats and pumpkin seeds and stir into the mix. 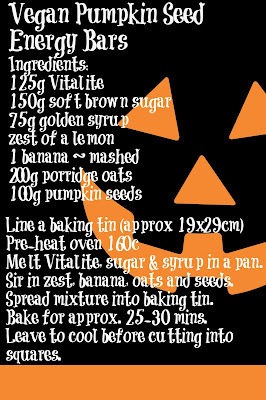 Spread the mixture into the baking tin and bake for 25-30 minutes. 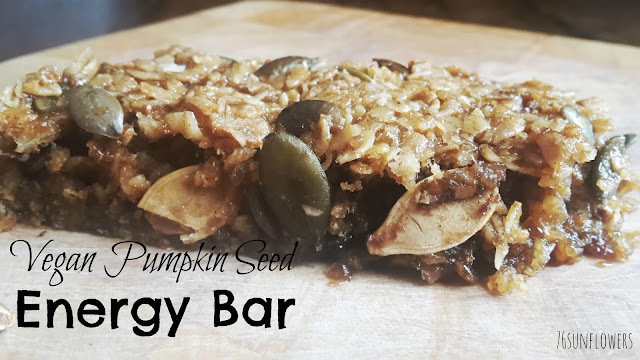 Once cooled I enjoyed a slice with a cup of cinnamon tea and a handful of extra pumpkin seeds before tacking the garden for it's annual Autumn makeover.